A relative newcomer, information about JAS Audio and its products is limited, on both the company's own website and via UK importer Shadow Audio. A company statement tells us it's a: "Hong Kong based Hi-End Hi Fi equipment design house. The R&D team is a combined force of engineers from US, Hong Kong and China". The website shows an extensive range of classy loudspeakers, plus some valve amplification, but no information on the company history or its production facilities - most likely the latter is handled by outside suppliers based in China itself, which would explain the competitive pricing. This £1,395 per pair Orsa is actually the least costly model in the JAS Audio speaker portfolio, and it's an unusual design in a number of respects. It's a good size standmount, constructed from two separate enclosures that are spaced slightly apart so that the port exit operates in the gap between. 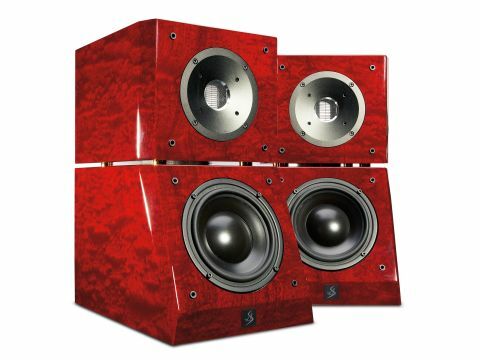 Both enclosures are beautifully finished in a deep red Makore veneer with multiple coats of high gloss lacquer. The front baffles are set at different angles, the lower one tilts backwards at 20 degrees from the vertical, while the top of the upper enclosure is tilted forward at some seven degrees. It's a two-way design, housing a 150mm bass/mid driver with a 115mm plastic cone/ dome diaphragm in the larger, lower enclosure. A ribbon tweeter, with pleated diaphragm roughly 20x45mm, occupies the top box, set deep behind a shallow, circular horn. Exactly how the port loading is arranged, and whether the upper enclosure takes an active role in loading the bass/mid driver, is impossible to ascertain from external inspection. Company literature makes much of the fact that the port output radiates through 360 degrees, via the slot between the two enclosures, claiming that this is the subject of a patent application. This is puzzling; any port will invariably radiate omni-directionally, since the source will always be smaller than the bass wavelength it's reproducing. And floorstanders with downward-firing ports are by no means unknown - witness the Focal. The tilts applied to the baffles help spread the internal standing waves, and internal damping is supplied by pure wool. The rear panel carries a single pair of high quality locking terminals, and a switch labelled Reference/Dynamic: the former was used throughout our tests. Although the Orsa has its peculiarities, in both design and measured performance, the sound it creates nevertheless has considerable charm. There are certainly grounds for criticism, especially in the decidedly modest bass extension and exposed treble. But there's also decent coherence that is very persuasive and engrossing, making it easy to focus one's attention on the music rather than become distracted by sonic limitations. Although low bass is absent, the mid-to-upper bass has an evenness and neutrality that's more than fair compensation. Stereo images are laid out precisely, with decent focus and a reassuring lightness of touch. In part because the presence zone is rather too restrained, the treble is obvious and exposed, but it's also quite sweet and clear, so that fine detail is clear and coherent. Add in the wide dynamic range and spaciousness that's typical of the fine enclosure control and low box coloration offered by a very substantial standmount, and the result is a speaker that is musically rather more than the sum of its fantastic-looking parts, even if you include the limited bass weight.